The Turks have an eggplant dish Imam bayildi, the imam fainted, with pleasure because the dish was so very delicious. First time I ate it, I swooned too and became enamored of eggplant. Gardening at a community garden for a decade, our eggplant were devoured by black flies year after year. The past two years at my new garden location, I can grow eggplant organically without pests. What a treat! 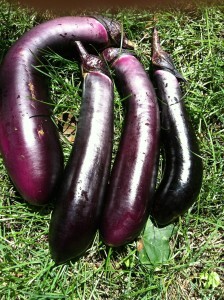 Many, great, glorious and gorgeous eggplant to be enjoyed all summer long! Eggplant originates from northern India which explains the many great Indian eggplant dishes. Arabs brought it west to Muslim Spain where it was called the apple of love and believed to be an aphrodisiac. Europeans warmed reluctantly to aubergines (eggplants) because it’s a member of the deadly nightshade family. Eventually, the Italians createdcaponata and eggplant parmesan, the French ratatouille and the Greeks moussaka. An eggplant is the fruit of the plant, a vegetable fruit. I grow two variety of eggplant: japanese and western globe. The japanese eggplant are long, narrow, 6-8 inches finger eggplants. Some are purple and some lavender. The flesh is cream-colored and sweet. When picked at perfect ripeness, japanese eggplant does not need peeling. The western/globe eggplant is the large, imperial purple, patent leather eggplant we’re familiar with. When picked promptly at about 12-16 ounces, the skin is glossy, tight and firm, and the flesh cream-colored with few seeds. If left too late or picked and not used immediately, the skin becomes slack and the flesh darker, seedy and bitter. In truth, I’ve never grown a bitter eggplant. I must also confess that, although I can tell the difference in texture and coloring between japanese and globe eggplant, I cannot taste significant difference. I believe that globe eggplant, if picked at perfect ripeness and prepared immediately, is equally sweet and flavorful. Being larger it’s easier to prepare. So the difference between the two varieties becomes serving size. I pick my eggplant to eat the same day. Eggplant doesn’t like cool weather so it doesn’t do well in the refrigerator either. If I must store it, I leave it in the fruit bowl on the kitchen counter but never more than one day. When picking, I cut the thick stem with scissors and am careful not to press the skin because the flesh beneath is soft and spongy. To prepare, I remove the calyx stem and slice the eggplant in half. I then salt and place it in a bowl so it sweats for about half an hour. Not to remove any bitterness but to remove the sponginess in the flesh which otherwise soaks up excessive oil in cooking. I enjoy a lot of simply roasted eggplant. I put two halved, sweated eggplants face down on an oiled sheet pan and roast at 400 degrees 45-60 minutes until soft when forked. (I usually roast onions too. See also sweet onion entry.) Once soft and cooled, I scoop the golden eggplant flesh out of the skins and into a bowl. I squeeze the roasted onions out of their papers. Mash eggplant, onion, olive oil, salt and pepper to taste. Maybe a splash of lemon juice or some fresh garlic. Great warm, room temperature or cold. Spread on crostini. Enjoy as salad. If you prefer a sweeter and more complex dish, roast a red pepper too. (Be careful to check frequently because the pepper, onions and eggplant will be done at different times.) Let the pepper cool and remove skin and seeds. Mince a clove or two of garlic. Mash the pepper and garlic along with the eggplant-onion mix. Stir in 1 teaspoon lemon juice and a tablespoon of honey. Ambrosia. It’s easy to spruce basic roasted eggplant up into a simple ratatouille. Add to a pan with sauteed garlic, onion and two large chopped tomatoes. Cook 10-15 minutes until the juice from the tomatoes coalesces into a thick sauce. Salt and pepper to taste. 1. Preheat the oven to 400 degrees. Wash and dry the eggplant. Leaving on the stem, slit the eggplants on one side. Sprinkle salt inside and set aside for 30 minutes. 2. Heat about 8 tablespoons of olive oil in a large pan. Fry onions, peppers and garlic for about 10 minutes until tender. Add tomatoes and spices, and cook until the tomato juice forms a sauce. Stir in half the parsley and pinenuts. Remove from heat. 3. Rinse the eggplant and place in a baking dish. Carefully prying open the eggplant, spoon in the onion mixture. Add 1/3 cup of water, any pan juices and extra stuffing to the pan around the eggplant. 4. Cover the pan with a lid or foil. Bake for 30-45 minutes until fragrant. Serve at room temperature sprinkled with the remaining, fresh parsley. This entry was posted in eggplant. Bookmark the permalink.